George Batsakis, formerly an executive vice president at CSRA, has been appointed head of the defense and intelligence practice at Accenture‘s (NYSE: ACN) federal services business. 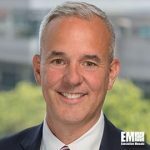 He will oversee the development and delivery of technology platforms to government clients that include the departments of Defense and Veterans Affairs, Accenture announced last week. John Goodman, chief executive of Accenture Federal Services and a 2018 Wash100 recipient, said Batsakis will work with clients to identify technologies that can help them address mission challenges. “This is a dynamic time for the defense and intelligence industry. AFS is at the forefront of helping the DoD and intelligence community embrace IT modernization and business transformation. In my new role, I look forward to applying my experience to help our clients solve their most complex challenges to better meet their missions and serve the needs of the country,” Batsakis told GovConDaily Monday. Batsakis held a seven-year career at CSRA, which General Dynamics (NYSE: GD) acquired through an approximately $9.7 billion deal that closed in April. He has led CSRA’s growth strategy and business development efforts across its technology and digital consulting areas, shared-service delivery organization and cross-sector teams. The more than 25-year industry veteran previously served as EVP of SRA International’s national security group and managed a defense operating unit at Northrop Grumman (NYSE: NOC). Before he joined the private sector, Batsakis was a U.S. Army infantry officer and worked in command and staff positions at the Army National Guard.